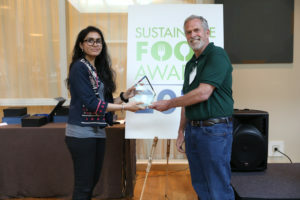 Ecovia Intelligence announced the winners of the premier Sustainable Food Awards at a dedicated awards reception in Amsterdam in June. The awards give recognition to operators who are helping build a sustainable food industry. Entries were received from every continent, with the winners and runner-ups selected by a jury comprising a natural beverage firm, multinational food company, packaging materials supplier, media, and research agency. Bogawantalawa Tea Estates (Sri Lanka) is the winner with its Uncompensated Carbon Neutral Teas. Produced in the Golden Valley of Ceylon, they are the first certified climate-neutral teas that are marketed in European retailers. Coop Switzerland is runner-up with its Insect-Based Food Products. The Swiss supermarket chain introduced insect burgers, balls, and bars last autumn; the products provide a sustainable alternative to conventional meat-based products. Other finalists were Chocolero Energy Drink (Belgium) and SeaMore I Sea Bacon Meat Substitute (the Netherlands). EOSTA (the Netherlands) received the top award for Natural Branding, which uses laser technology to mark organic fruits and vegetables. The technique replaces plastic packaging, saving many thousand tonnes of CO2 emissions in its first year. Coop Switzerland is the runner-up with its Multi-Bag. Made from sustainable wood-based material, it is as an alternative to plastic bags commonly used to pack food products. Sirane Earthpouch (UK) was the other finalist. Agrasys (Spain) is the winner with Tritordeum, a new natural cereal produced by a combination of durum wheat and a wild barley. Made by cross-breeding (and not GMO), the grain is being used in flour, bread, biscuits, pasta and related products. Aliet Green (Indonesia) is the runner-up with Organic Coconut Sugar. Certified organic and fairtrade, the coconut sugar helps empower female growers in Yogyakarta, Indonesia. The other finalist in this category was Dani Organic Foods (UK) with Organic Ginger. Straus Family Creamery (USA) is the winner. Under the leadership of Albert Straus (shown in picture above), the enterprise has pioneered organic dairy farming in California, and is now undertaking climate-friendly production methods. Lotus Foods (USA) is the runner-up for promoting System of Rice Intensification (SRI). The company is encouraging biodiversity by getting growers in developing countries to produce organic and wild varieties of rice. Nature’s Path Foods (Canada) is the winner. A pioneer in the production of organic breakfast cereals, the company is investing to become climate-neutral, zero-waste and socially responsible. Palsgaard (Denmark) is the runner-up. Specialising in emulsifier production, the company is setting up carbon-neutral sites across the globe and undertaking sustainability in its supply chains.